All of us need to get things done. Few of us have the genius or the vision to come up with a system for, you know, getting things done. David Allen, sensing this particular void in the productivity and self-help book marketplace, published the aptly titled Getting Things Done in 2001, which was soon followed by a sequel called Ready for Anything. On Tuesday, Allen’s latest opus, Making It All Work, hits bookstores. Not surprisingly, Allen’s “art of stress-free productivity” has inspired a raft of applications for the iPhone and iPod touch aimed at putting his principles into practice. OmniFocus ( ) is sort of the 800-pound gorilla of GTD applications, but instead of revisiting that, I looked at a few simpler tools available at the App Store. Habit-Forming: Habits shows how often you’ve done a recurring task and how often you’ve skipped it so that you get in the habit of getting it done. Habits by Louis Franco helps users form good habits, which sounds simple enough. But developing habits requires a bit of time and discipline. It requires repetition and awareness. Habits keeps your calendar free from clutter associated with routine tasks or the general stuff of life. Whether the habit is walking four miles a day or calling your mom, you don’t necessarily need to do it every day or every week, and you don’t necessarily need to do it at a prescribed time, but you need to do it. Habits keeps your habits organized and keeps score of how well you do. You can set up your habits for every day, every other day, every weekend, every few days, every week and every month. I would also suggest giving users the option of selecting every morning or every evening. Habits’ home screen shows what you need to do right now, or soon. 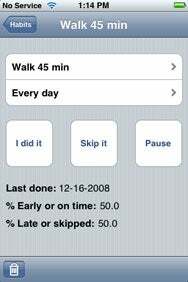 Tap the item and then tap a button indicating whether you “did it,” or “skip it,” or “pause”—a helpful feature if you are on the road, for example. The app will show you when you last performed the task, and display a percentage of how often you did the task early or on time, and how often you were late or skipped. You can also change how often you will perform the particular task. GTD weighs heavily on lists and list-making, and a pair of apps aim to help expedite that process. I wanted to like Buckaroo Software’s CheckOff more than I do, and as a simple checklist app, it has a few features to commend it. 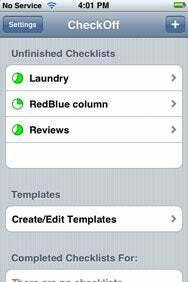 You can create checklist templates with ease. Even more impressive, the app will auto-create lists on specific days of the week. If you have a certain routine you follow every Tuesday and Friday, for example, CheckOff can generate a list from the template you’ve set up for those days. The Pie Doesn’t Lie: CheckOff uses pie charts to show your progress on accomplishing a task. The more you’ve gotten done, the more filled-in the pie chart icon will be. If you need to deviate from routine and add or subtract an item, you simply tap the edit key, make your changes, and save. You can also create one-time checklists without relying on a template. I find this feature particularly useful for creating grocery lists and lists of items my family needs for trips. CheckOff shows you your progress by listing unfinished and completed checklists. Unfinished lists display with a small pie-chart like icon, giving you an approximate idea of your progress. CheckOff is more sophisticated than Habits, but does not compare well to a more comprehensive productivity app such as OmniFocus or Cultured Code’s more user-friendly Things ( ). Of course, those applications—which are considerably more expensive than those under review—are also companion tools for desktop software. Neither CheckOff nor Habits sync with your desktop or laptop. They are much simpler apps, with narrower functions. You take the good, you take the bad. Another key feature of GTD is the Two-Minute Rule: Do anything you absolutely must do that you can do right now in two minutes or less. “Do it,” Allen writes. “If an action will take less than two minutes, it should be done at the moment it is defined.” Return that call, answer that e-mail. You will see a ten-fold time benefit over the long term. Time And Again: Though it’s designed to time things in two minute bursts for GTD purposes, GTD 2 Min Timer lets you set any amount of time up to an hour with the app’s scroll wheel. Developing a two-minute timer app was a no-brainer. Hobbyist Software’s GTD 2 Min Timer does exactly what it says. Launch the app and the timer starts immediately, which is a bit disconcerting at first. Timer lets you select from 11 alarm sounds—the default factory whistle is appropriate for the tool. Or you can turn the alarm off. If all GTD 2 Min Timer did were count down two minutes and whistle at you, it would hardly be worth a dollar. You can use the scroll wheel to set the timer for up to an hour and start and stop at any time, which makes it a useful app for keeping meetings under control. Finish your task early, and simply tap the app’s reset button and the timer will restart at two minutes—or whatever time you’ve set on the wheel. I can think of a few of former editors of mine who would benefit from GTD, come to think of it. Bottom line: If you are looking for simple, clever tools to help you be productive, these apps may fit the bill. But if comprehensive tools are what you seek, you will be disappointed.